Family Stories: A Baby Boy! She had no way of knowing how her simple reply to my email would affect me. I mean, how could she? We didn't know each other. And we still don't. But with that email reply, she gave me some hope. Hope that maybe I'd know whether my thoughts on the matter were right. That perhaps I had a lead or a clue. However, with the envelope and copies she sent me, the Archivist for the Catholic Archdiocese of Galveston-Houston took away my hope of being right, but gave me such a special little unexpected gift. Okay. I knew he was there from my email, but that little bundle of joy wasn't exactly real for me until I was holding a copy of his entry in the baptismal register. 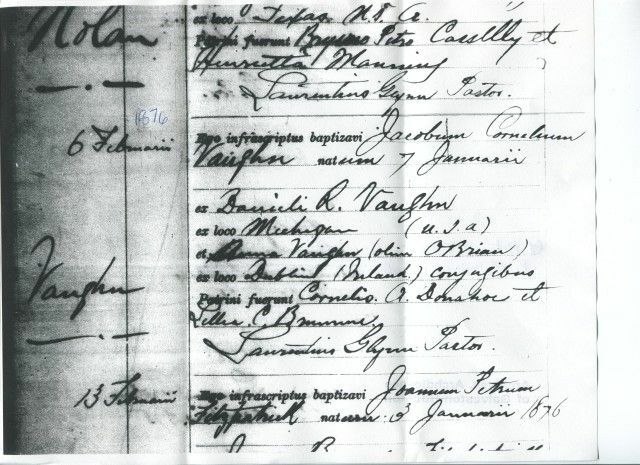 Jacobum Cornelium Vaughn's entry in St. Patrick's Cathedral Baptismal Register, 1876. Jacobum Cornelium Vaughn was born 7 January 1876 and was baptized 6 February 1876 at St. Patrick's Church on Galveston Island, Texas according to a copy of his entry in the baptismal register. His parents were listed in the baptismal record as "Danieli R. Vaughn" and "Anna Vaughn (olim OBrian)" ~ my 2nd great-grandparents: Daniel R. Vaughn/Vaughan and Anna/Annie O'Brien. Now. Their names look a little "funny" but as the archivist so kindly explained in her accompanying cover letter, their names are in Latin form. So, I Googled until I found what everything meant. I'm curious like that. And if you are too, here are the websites I found and liked that help me out with the Latin in church records: The Parish of Atherton in the County of Lancashire [I really liked their table of Latin name forms and the explanation of how folks' names were written down.] and the Latin Genealogical Word List by Kimberly Powell on About.com. According to The Parish of Atherton in the County of Lancashire's website and their handy-dandy explanations and tables, Danieli was the Latin form of Daniel and because of the ending that meant he was the baby's father. And Jacobum is Latin for James, and because Jacobum was the one being baptized [the star of the show], his name ended with -um. But what about his middle name, Cornelium? I was kind of hoping that was a clue to perhaps a maternal line in Annie's family. Obviously, the base of the name is Cornel- or Corneli-. Again the ending is -um indicating he's the star of the show. But? The names written in the sponsors lines is where my hopes were dashed. His sponsors were Cornelio A. Donohoe and Lillia A. Bruenne. [I think. A preliminary look in census records didn't clear up her last name for me because I couldn't find her. 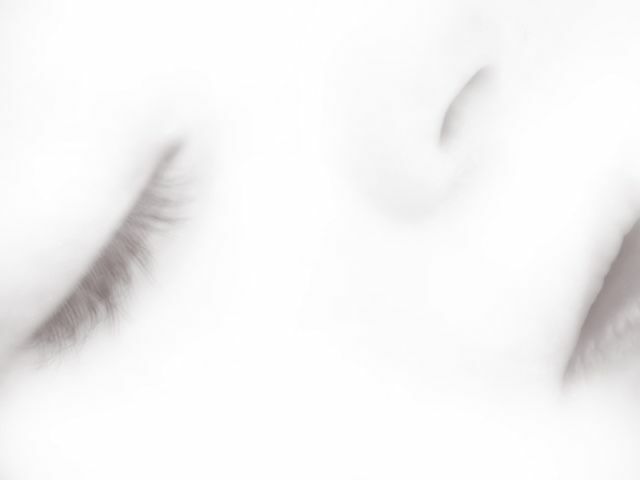 I will look again later.] The ending of Cornelio indicates a witness to the event. A witness. And not necessarily a family member. However, I'm not in complete despair though. I'm pretty sure Annie didn't have any relatives here, but I could be very wrong. I, at the very least, have 2 more names to hunt down like the prey they are. Anywho, this document ~Jacobum Cornelium's baptismal register entry~ was created in 1876 which is much closer to Annie's birth than when her death certificate was created in 1918. [Kind of a 'duh' statement, I know, but sometimes those need to be said. Or written.] And Annie is more than likely the one to have given that nugget of awesomeness [a.k.a., her place of birth] to the priest. We don't know if Annie really knows where she was born because while she was there, she wouldn't have remembered everything. [Do you? That's what I thought.] But no matter. This is just a scrap of a clue. This is still a step forward in my opinion. It's still daunting to think that I need to look for an Annie J. O'Brien who was born and hopefully baptized in a parish in Dublin, Ireland with a father maybe named James . And she may have been a Mary Anne in those yet to be looked for baptismal records. Maybe. And what does this have to do with my DAR [Daughters of the American Revolution] and UEL [United Empire Loyalists] applications? Well, the reason I ended up with Jacobum's baptismal record is because I was looking for his younger sister's [my great-grandmother's] baptismal record. I need that because Texas didn't start statewide birth recordings until 1903-ish. And it was sent to me as well as other siblings' records [Because that Archivist rocks!]. I need evidence of her birth and this was the closest thing I could think of to the event of her birth that might have been documented that would indicate her birth. And I was right. But I think the most important thing to emerge about this is the story ~ Jacobum Cornelium's story. I know that James [Jacobum] doesn't make it. At some point he dies young. I don't know when, but I'll find out. I'll try to find where he was buried. [Not an easy thing to do on an island on the Gulf that gets hit with hurricanes and has a ton of cemeteries.] He was possibly named after his maternal grandfather and he was baptized in a beautiful cathedral on Galveston, Island. And, yeah, it's still there today. He was quite possibly swaddled in a blanket. Maybe it was cold. Rain or sunshine ~ who is to say? On 6 February 1876 little Jacobum Cornelium received his first of seven sacraments. Did he robustly cry while being held by the unfamiliar Father Glynn? Or did he coo? His parents were quite proud, I can only imagine. Perhaps Annie smiled at some point. Moved to tears? I don't know. Possibly. But I do know he existed. His story was short. But little Jacobum Cornelium was here. I've no doubt about that. So, little Jacobum Cornelium [James Cornel] has been added to the family tree. And to my list that seems to grow. You know, the list of people whose story I will find and tell? When did James die? Why did he die? Where is he buried? St. Patrick's Cathedral (Galveston, Galveston County, Texas). Baptismal Registers. Roman Catholic Archdiocese of Galveston-Houston, Houston, Texas. Oh, that's so sweet and exciting all at the same time that you found this precious little boy! Congratulations! I came to this site by way of a tweet and I'm really glad I did! I love the way you write. You had me hooked from the beginning. Great post. Great post! Could the witness, Cornelio A Donohoe, be the reason for little James' middle name? I find it very interesting that a man with such an unusual first name (I mean it's not John, William or James after all) is witnessing the baptism of a child that is given the same name. Hmmm, anyway it was just a thought. If it were me (I do a lot of Irish research), I'd read the Latin as "Cornelius,"a fairly popular Irish name, often in other records as Neil or Neal. So, if you're trying to trace that witness in the census, etc., be sure to try the Neal variations... If the Cornelius is on the O'Brien side, you may have hit gold, 'cause all you can hope with an "Annie O'Brien, daughter of James" is that SOMEONE in the family has a less common name. Like, say, Cornelius. And keep in mind "Donohoe" is a frequent variant for "Donohue" or "Donoghue"-- and considering how very Irish the names are in amongst all those non-Irish names, I'd strongly suggest the Donohues are relations of some sort of the O'Briens.